The Throttle Body Injection (TBI) system is a single injector system that introduces fuel into throttle body from above throttle plate. 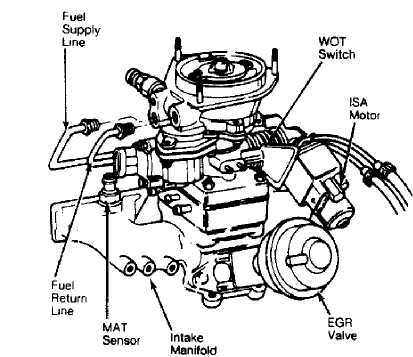 Fuel injector, located within throttle body, is controlled by the Electronic Control Unit (ECU). The ECU is a sealed microprocessor that receives input signals from several sensors and other related engine components. Based on these inputs, ECU generates output signals that control and adjust air/fuel mixture and ignition timing as necessary for proper engine performance. systems, upshift indicator light (manual transmission only), and A/C compressor clutch. On Cherokee, Comanche and Wagoneer, ECU is located under instrument panel, above accelerator pedal. On Wrangler, ECU is located behind glove box. 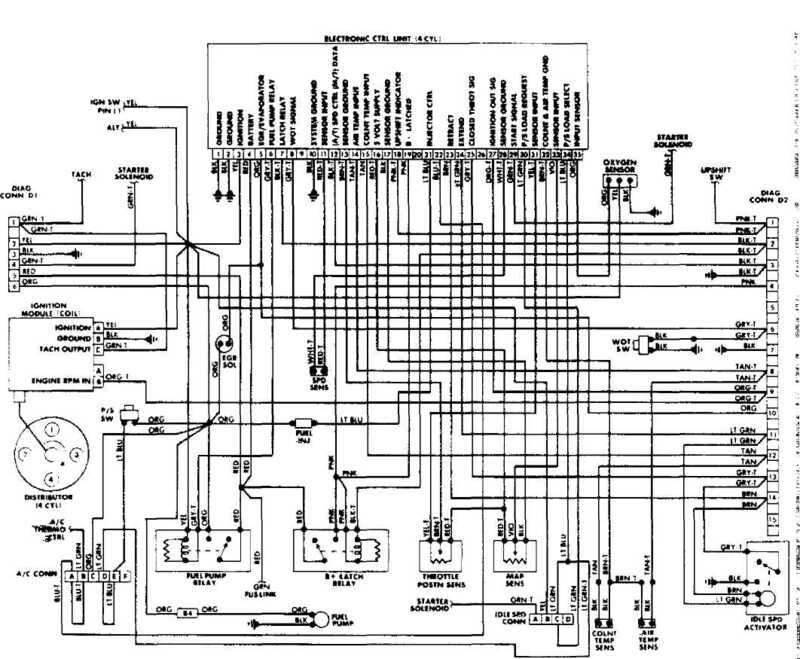 Input information from various engine sensors to ECU is used to determine engine operating conditions and needs. Battery voltage input is used to ensure that correct output voltage is supplied by ECU during fluctuations in battery voltage. 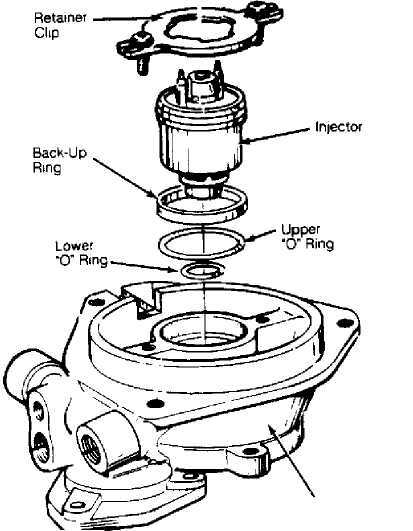 Fuel injector is mounted in throttle body so that fuel is injected into incoming airflow. When injector solenoid is energized, armature and plunger move upward against spring. Check ball above injector nozzle moves off seat and opens small orifice at end of injector. Fuel supplied to injector is forced around ball and through orifice, resulting in fine spray of fuel. Volume of fuel injected is dependent only on length of time that injector is energized by ECU, as fuel pressure is constant at injector. During cold engine starts, extra fuel is supplied so richer mixture will aid in starting. 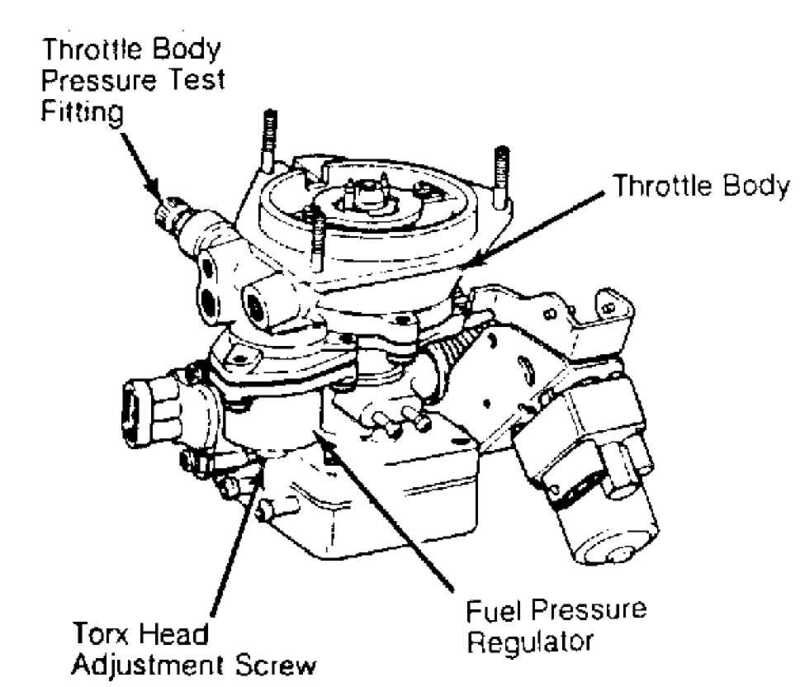 Fuel pressure regulator is integral part of throttle body. Pressure regulator has a spring chamber that is vented to same pressure as tip of injector. Because differential pressure between injector nozzle and spring chamber is same, only the length of time that injector is energized controls volume of fuel injected. Fuel pump delivers more fuel than is required by engine. Excess fuel goes to fuel tank from pressure regulator via fuel return hose. Fuel pressure regulator function is mechanical and ECU does not control it. Electric roller type fuel pump is located in fuel tank. Integral check valve is used to maintain pressure in fuel delivery system after pump stops running. Fuel pump operation is controlled by ECU through a fuel pump relay. 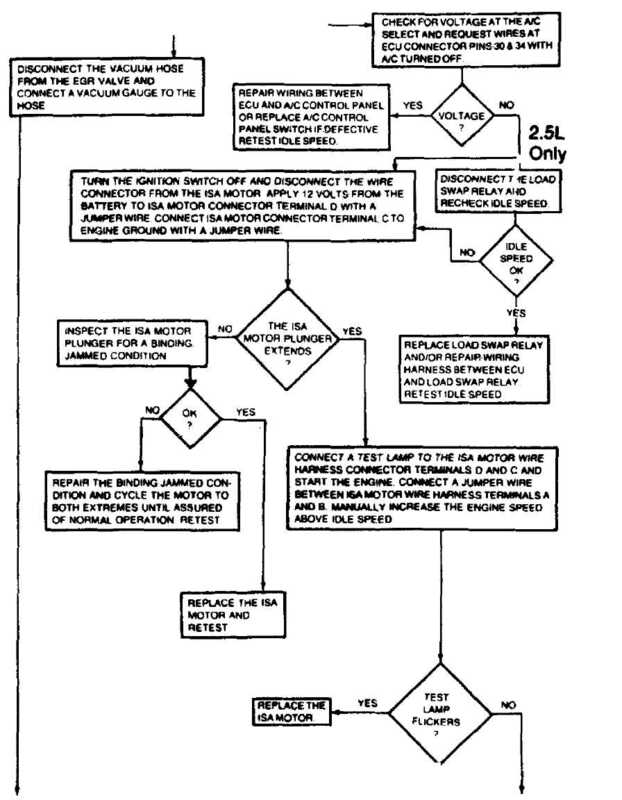 ISA motor acts as movable idle stop to change throttle stop angle. Both engine idle speed and deceleration throttle stop angle are set by ISA. ECU controls ISA motor by providing appropriate voltage outputs to produce idle speed or throttle stop angle required for engine operating condition. Oxygen sensor is equipped with a heating element that keeps sensor at proper operating temperature at all times. Oxygen sensor is located in exhaust pipe. 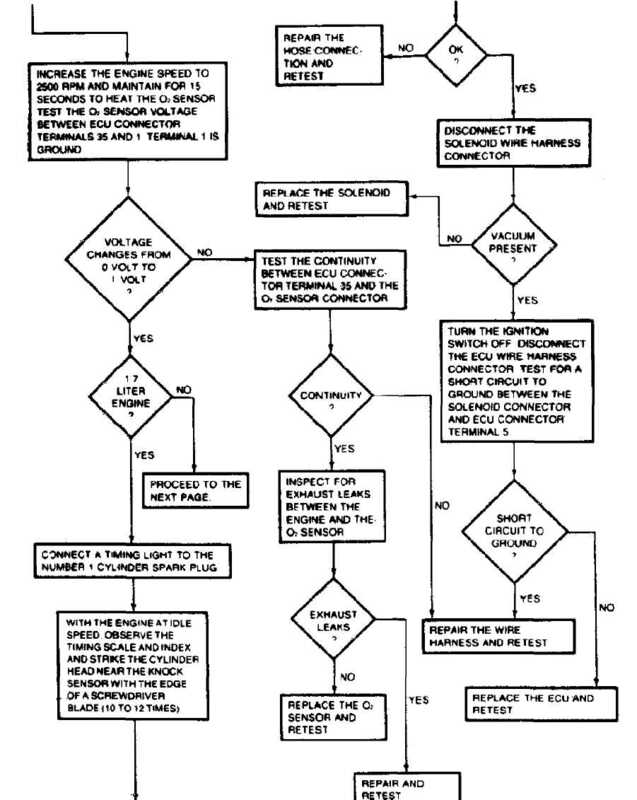 Maintaining proper sensor temperature at all times, system enters "Closed Loop" operation sooner and remains in "Closed Loop" during periods of extended idle. 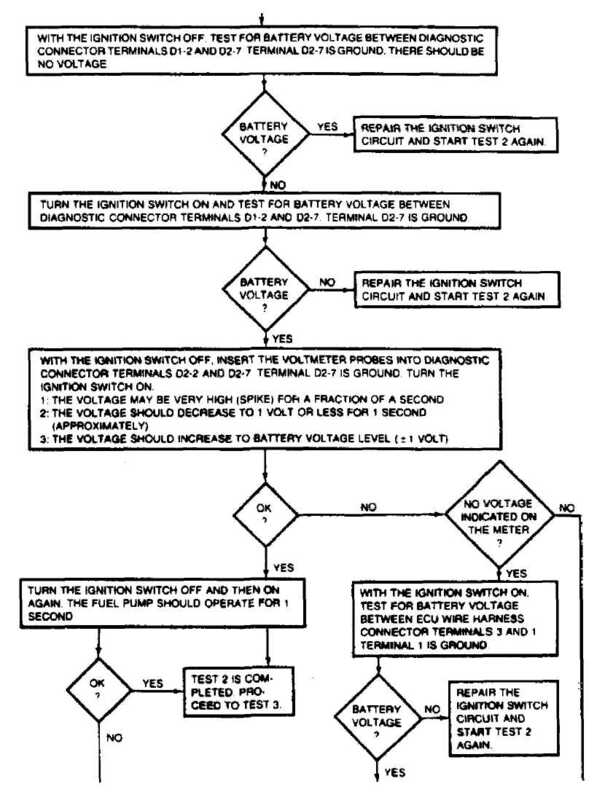 Electrical feed to oxygen sensor is through ignition switch. The ECU receives sensor voltage signal which varies with oxygen content in exhaust gas. Signal is used by ECU as reference for setting air/fuel mixture ratio. ECU varies voltage to injector both to compensate for battery voltage fluctuations and to change duration of injector opening for control of air/fuel mixture. MAT sensor provides a signal to ECU that changes depending upon temperature of air/fuel mixture in intake manifold. During high temperature conditions, ECU will compensate for changes in density of air. MAP sensor measures absolute pressure in intake manifold. Both mixture density and ambient barometric pressure are supplied to ECU by MAP sensor. Sensor is mounted in middle of firewall in engine compartment. Sensor receives manifold pressure information through vacuum line from throttle body. See Fig. 1. Fig. 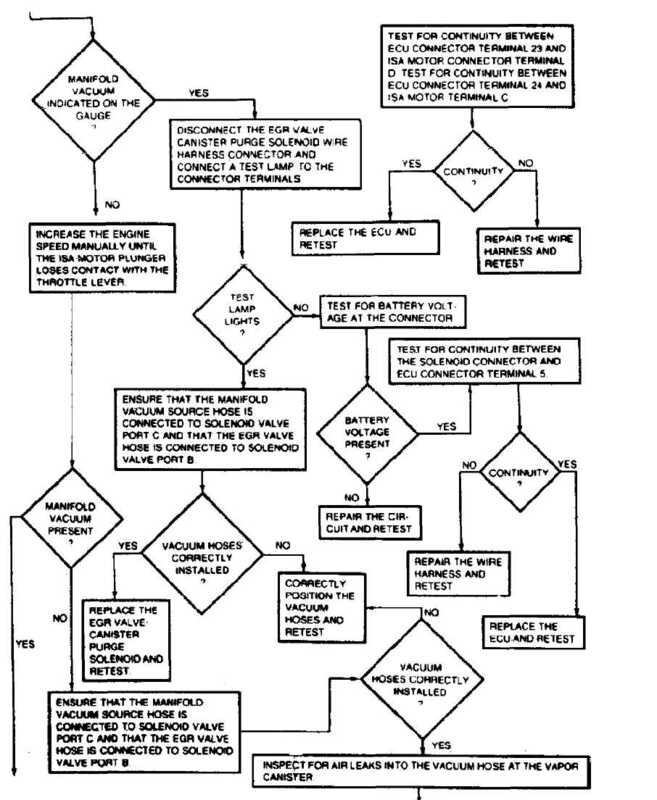 1: Manifold Absolute Pressure (MAP) Sensor Courtesy of Chrysler Motors. Coolant temperature sensor is installed in intake manifold water jacket to provide coolant temperature input signal for ECU. During cold engine operation, ECU will make mixture richer, make up for fuel condensation in cold intake manifold, increase idle speed during warm-up period, increase ignition advance and keep EGR system inoperative until engine warms up. Throttle position sensor provides ECU with input signal, up to about 5 volts, to indicate throttle position. This allows ECU to control air/fuel mixture according to throttle position. TPS is mounted on throttle body assembly. WOT switch provides an input signal to ECU when engine is at wide open throttle. The ECU enriches air/fuel mixture. The WOT switch is located on the side of throttle body. Idle switch is integral with ISA motor and provides voltage signal to ECU. ECU will signal ISA motor to change throttle stop angle in response to engine operating conditions. On vehicles equipped with a manual transmission, ECU controls upshift indicator light. Indicator light is normally illuminated when ignition is turned on without engine running. Indicator light is turned off when engine is started. Indicator light will be illuminated during engine operation in response to engine load and speed. If transmission is not shifted, ECU will turn light off after 3 to 5 seconds. A switch located on transmission prevents indicator light from being illuminated when transmission is shifted to highest gear. Engine speed sensor is attached to bellhousing. 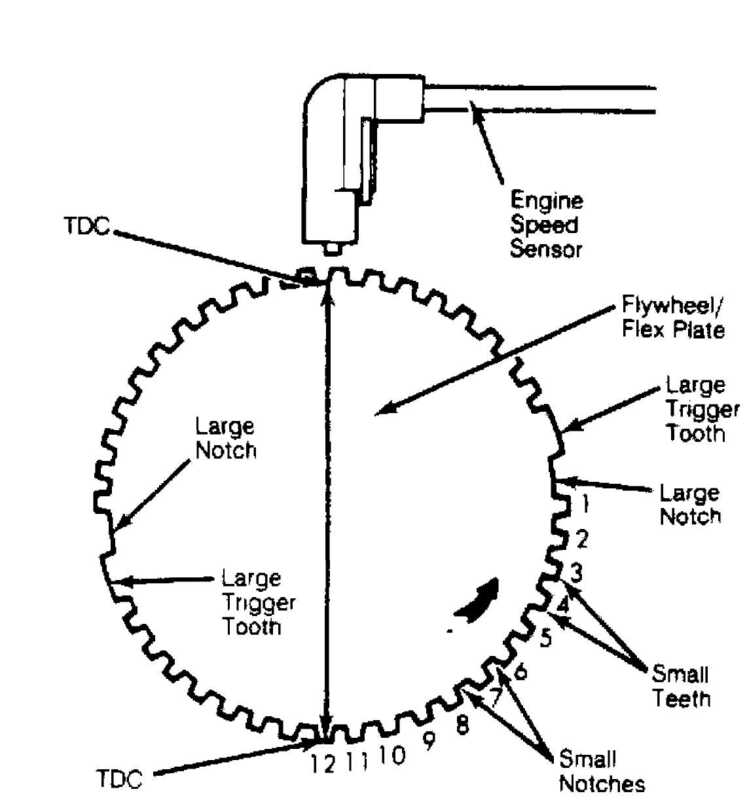 It senses and counts teeth on flywheel gear ring as they pass during engine operation. Signal from speed sensor provides ECU with engine speed and crankshaft angle. On flywheel gear ring, large trigger tooth and notch is located 90 degrees before each TDC point. Each trigger tooth is followed by 12 smaller teeth and notches before TDC point is reached. As each of 12 small teeth and notches pass magnetic core in speed sensor, concentration and collapse of magnetic field induces slight voltage (spike) in sensor pick-up coil winding. See Fig. 2. Larger trigger teeth and notches induce higher voltage (spike) in sensor pick-up coil winding. These voltage spikes enable ECU to count teeth as they pass speed sensor. Higher voltage spike (from larger tooth and notch) indicates to ECU that piston will be at TDC position after 12 smaller voltage spikes have been counted. 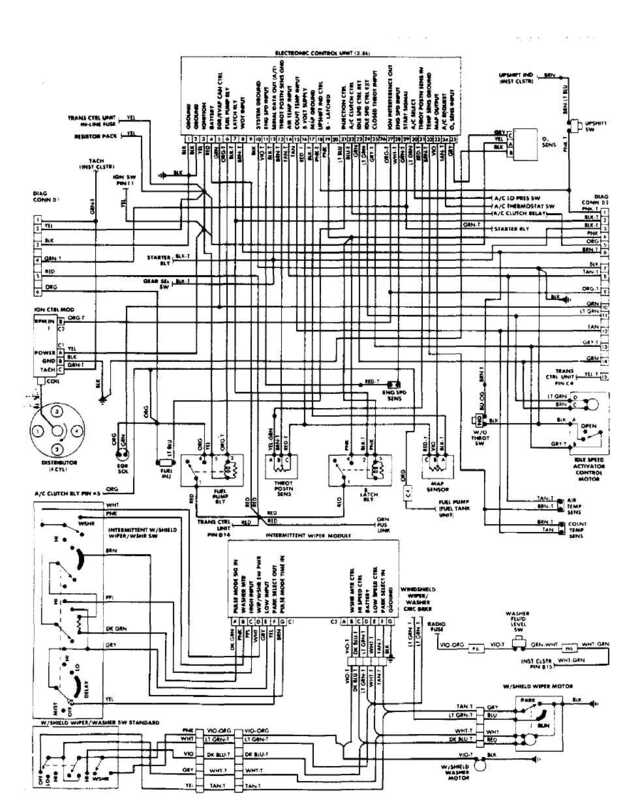 ECU will then either advance or retard ignition timing depending upon remaining sensor inputs. Fig. 2: Engine Speed Sensor Courtesy of Chrysler Motors. ECU receives inputs from A/C when either A/C switch is in "ON" position or compressor clutch engages to lower temperature. ECU changes engine idle speed depending upon A/C compressor operation. ECU receives input from pressure switch during periods of high pump load and low engine RPM. 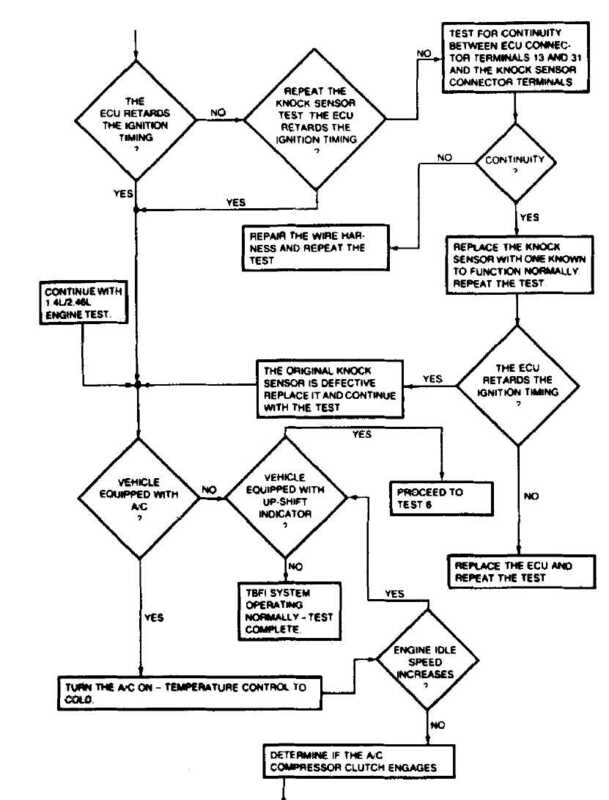 Input signals from pressure switch to ECU are routed through A/C request and A/C select input circuits. When pump pressure exceeds 250-300 psi (17.5-21.0 kg/cm), switch contacts close transmitting an input signal to ECU. ECU raises engine idle speed immediately after receiving input from pressure switch. Starter motor relay provides an input signal to ECU when starter motor is engaged. System power relay, located on right fender inner panel, is energized when engine is started. It remains energized for 3 to 5 seconds after ignition is off. This allows ECU to extend ISA for next start before ECU shuts down. Fuel pump control relay is located on right fender inner panel. Battery voltage is supplied to relay from ignition switch. When ground is provided by ECU, relay becomes energized and provides voltage to fuel pump. ECU controls A/C compressor clutch through this relay. The A/C compressor clutch relay is located beside fuel pump control relay on right fender inner panel. Vacuum to both EGR valve and vapor canister is controlled by this solenoid. When solenoid is energized, neither EGR valve nor vapor canister receive vacuum. Solenoid is energized during closed (idle) and wide open throttle operations, engine warm-up and rapid acceleration or deceleration. If solenoid wire connector is disconnected, both EGR valve and vapor canister will receive vacuum at all times. The load swap relay works in conjunction with power steering switch to disengage A/C compressor clutch. If compressor clutch is engaged when power steering pressure switch contacts close, input signal from switch to ECU also activates load swap relay. Relay then cuts off current to A/C compressor clutch. The A/C compressor clutch remains disengaged until pressure switch contacts reopen and engine idle returns to normal. The load swap relay contains a timer that delays engaging the compressor clutch for 0.5 second to ensure smooth engagement. CAUTION: When working on or near engine that is running, be very careful to avoid pulleys, belts and fan. DO NOT stand in direct line with blades of fan. DO NOT wear clothing that is loose enough to get caught in moving parts. operating temperature. Turn A/C off (if equipped). should move to fully extended position. provide engine speed of 3500 RPM. contact is made, check linkage and/or cable for binding or damage. period of time and then decrease to normal idle speed. on adjustment screw to prevent movement and maintain adjustment. hardens, loosen threads by heating screw with flameless heat such as soldering gun. DO NOT use flame or torch type of heat as damage to ISA motor will result. system before opening system. 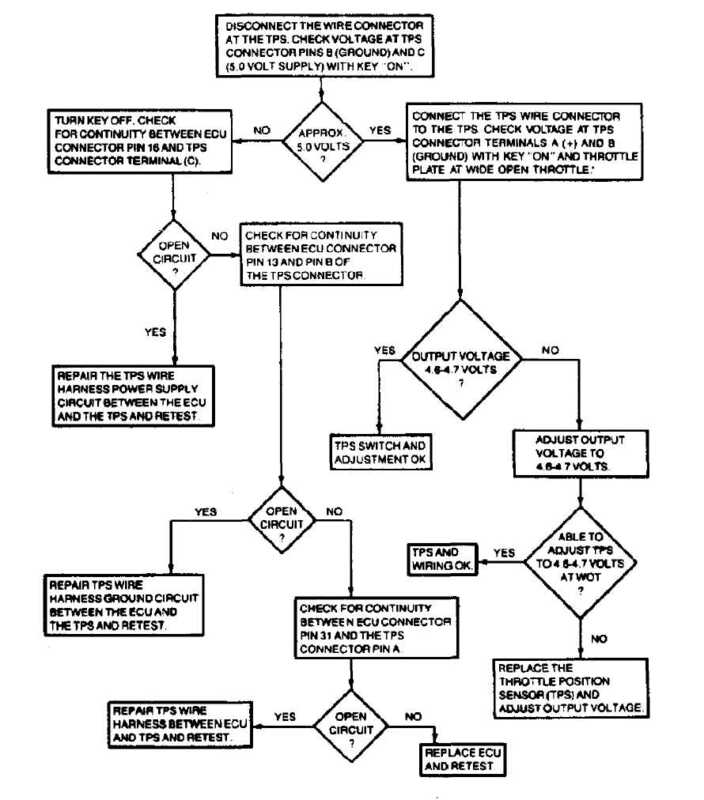 To prevent chance of personal injury, cover fittings with shop towel while disconnecting fittings. to terminal D1-3 and positive lead to terminal D1-1. See Fig. 4. Remove screw plug and install fuel pressure test fitting. NOTE: Fuel pressure test fitting is not included with throttle body. Fitting (8983 501 572) must be obtained separately. All models require fuel pressure of 14.5 psi (1.0 kg/cm). screw after adjusting fuel pressure. Turn ignition off. Remove measuring equipment and test fitting. Install original plug screw and air filter assembly. Fig. 3: Adjusting Fuel Pressure Regulator Courtesy of Chrysler Motors. lead to terminal "C" (M/T), or terminal "A" (A/T) of sensor connector. letters molded into back of connector. On all models, do not disconnect TPS harness connector. Insert voltmeter test leads through back of wire harness connector. On some models, it may be necessary to remove throttle body from intake manifold to gain access to sensor wire harness. from terminal "A" and connect it to terminal "B" (A/T). position (M/T), or maintain throttle plate in closed position (A/T). Ensure throttle linkage contacts stop. Note voltmeter reading. 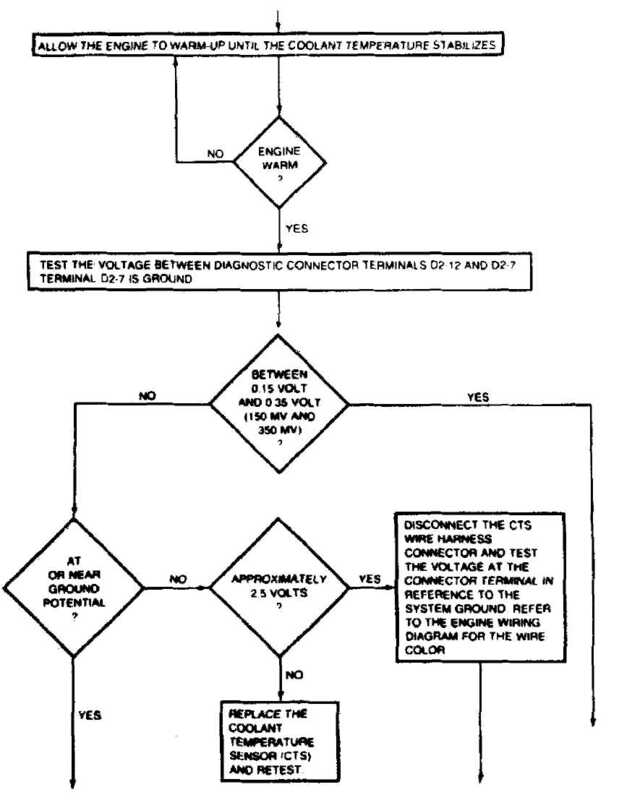 Output voltage should be 4.6-4.7 volts (M/T), or .2 volt (A/T). adjustment. Loosen top sensor retaining screw for fine adjustments. 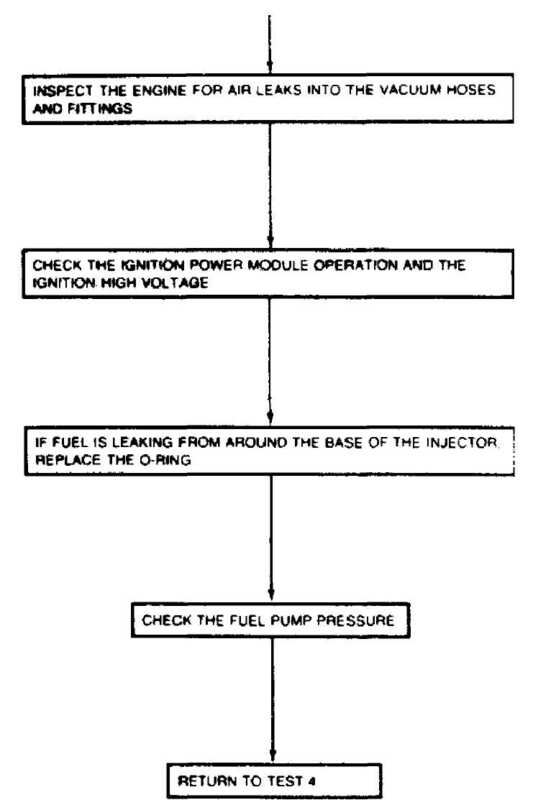 Fuel system pressure and delivery volume. Disconnect battery cables before charging. DO NOT modify or circumvent any system functions. impedance digital volt-ohmmeter (DVOM), check resistance of sensor. or resistance greater than one ohm is indicated. 1) Disconnect wiring harness from CTS. Using high input impedance digital volt-ohmmeter (DVOM), check resistance of sensor. Resistance should be less than 1000 ohms when engine is warm. Replace sensor if it does not fall within range shown in TEMPERATURE-to-RESISTANCE VALUES table. 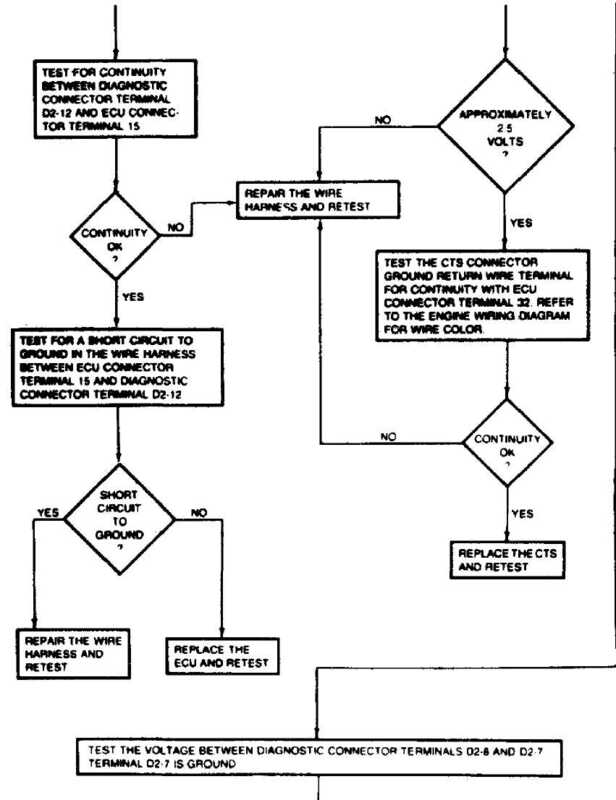 2) Test resistance in wiring harness between ECU harn terminal No. 32 and sensor connector terminal. Also test resistance in wiring harness between ECU harness terminal No. 15 and sensor connector terminal. See Fig. 5. Repair wiring harness if open circuit or resistance greater than one ohm is indicated. Turn ignition on. Check voltage at terminal connector without disconnecting from TPS. 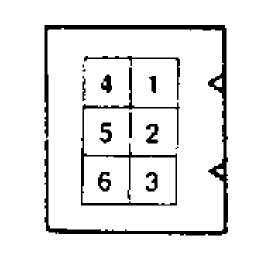 Terminal "A" (M/T), or terminal "B" (A/T ) is output voltage, which should be 4.6-4.7 volts at wide open throttle (M/T), or .2 volt at closed throttle (A/T). 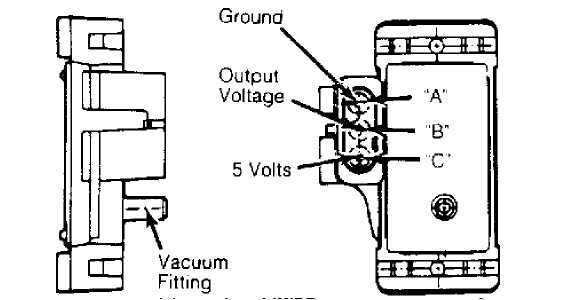 Terminal "B" (M/T), or terminal "A" (A/T) is sensor ground. 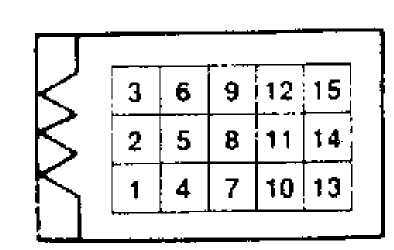 Terminal "C" (M/T), or terminal "D" (A/T) is input voltage, which is about 5 volts. 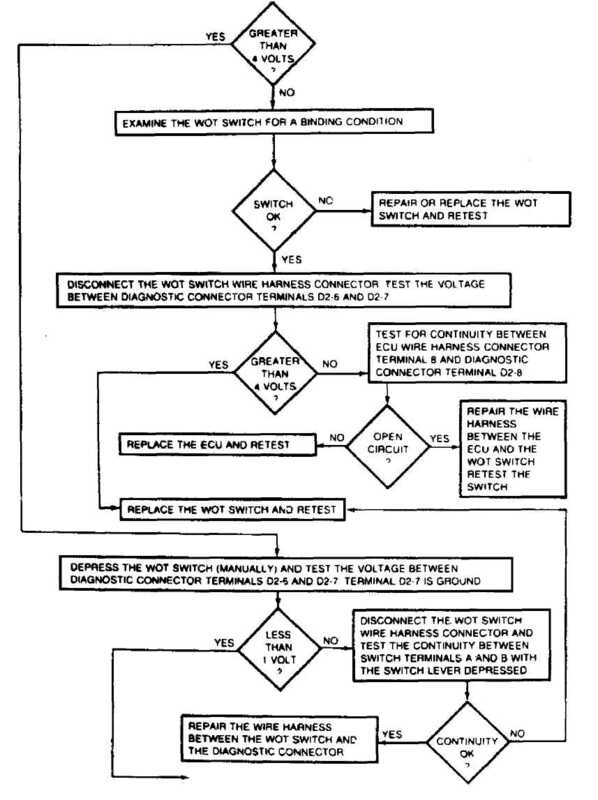 NOTE: ALL testing of idle switch must be done with ISA motor plunger in fully extended position. If switch cannot be tested without extending plunger, it is possible that ISA motor has failed. See IDLE SPEED ACTUATOR MOTOR ADJUSTMENT. connector. Replace or repair wiring harness as necessary. sensor connector. See Fig. 4. (MS 1700), test ECU if necessary. 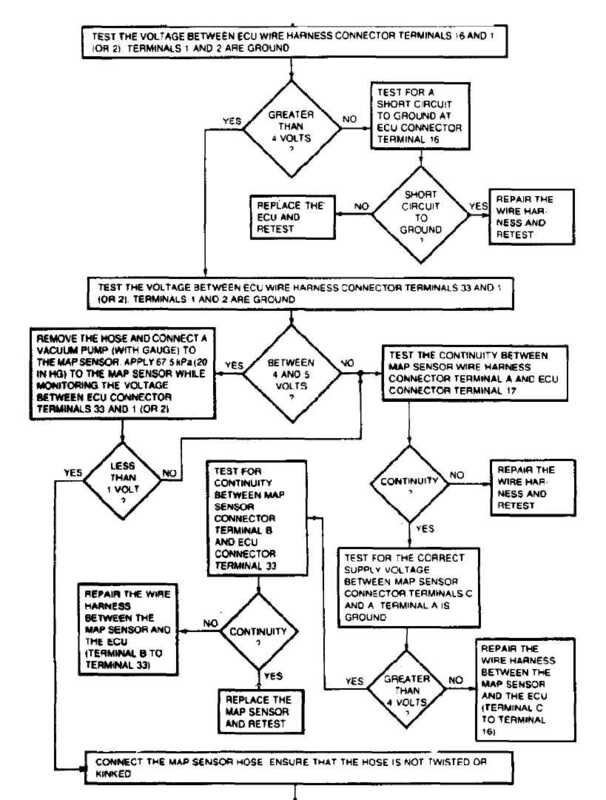 Check MAP sensor ground circuit at terminal "A" and terminal No. 17 of ECU connector. Repair wiring if necessary. 3) Using ohmmeter, check MAP sensor ground circuit between terminals No. 17 and 2 of ECU connector. If circuit is incomplete, check sensor ground connection on bellhousing, near starter motor. Replace ECU if ground is good. If terminal No. 17 is shorted to 12 volts, repair problem BEFORE ECU is replaced. 12-volt test light, jumper wires and probes. Hand vacuum pump with gauge. Fig. 4: Jeep/Renix Fuel Injection Diagnostic Connectors Courtesy of Chrysler Motors. procedures, no specialized service equipment is needed. Following diagnostic procedures are NOT applicable if special tester M.S. 1700 is used. 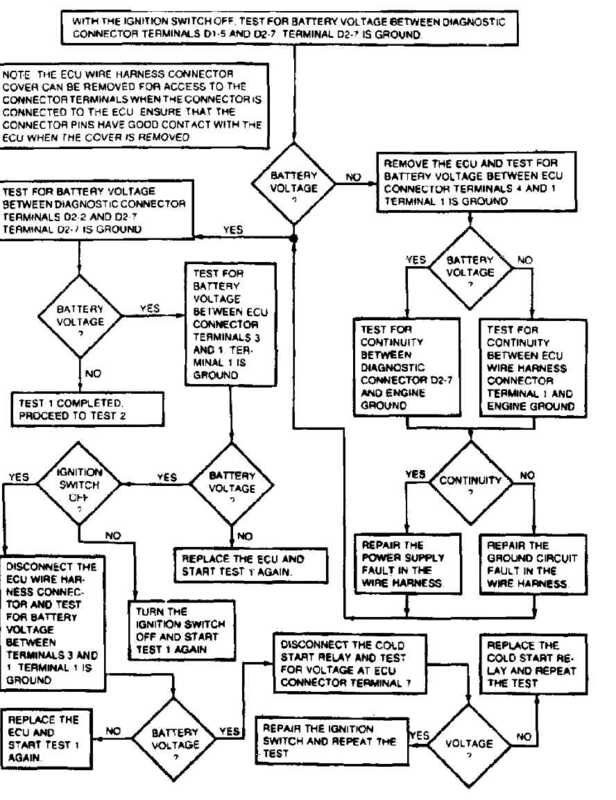 This test checks that system power provides for ECU memory keep-alive voltage. These tests check the following components and their circuits: closed throttle (idle) switch, Throttle Position Sensor (TPS), MAP sensor, A/T gear selector switch, Coolant Temperature Sensor (CTS) and MAT sensor. Coolant temperature and MAT sensors are tested in cold condition. 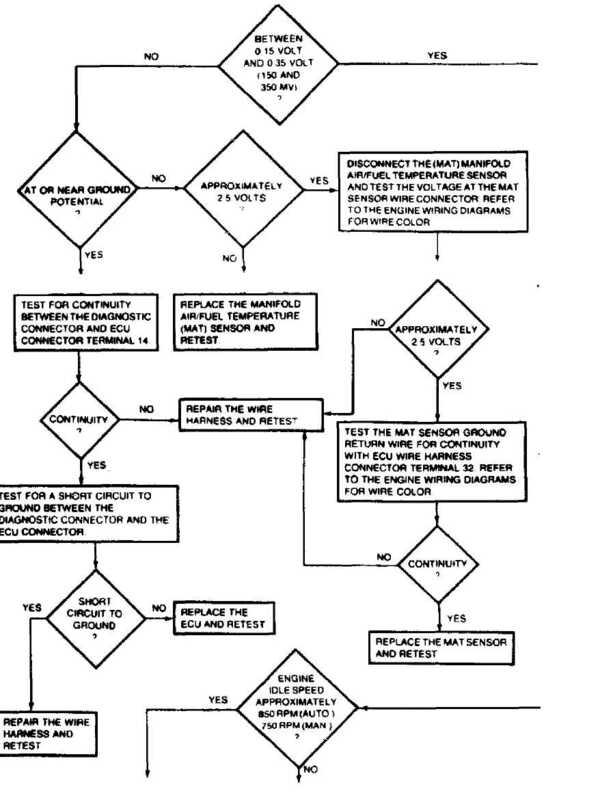 This procedure also checks all interrelated wiring circuits as well. These tests check engine start-up circuit, fuel injector, "Closed Loop" air/fuel mixture function, coolant temperature sensor function, MAT sensor function, detonation sensor "Closed Loop" ignition retard/advance function, EGR valve and canister purge solenoid function, idle speed control and A/C control functions. 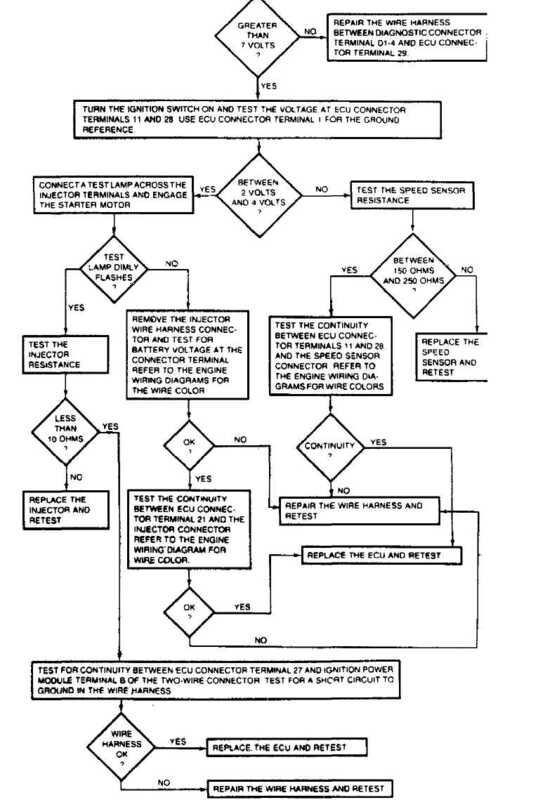 This test indicates failures in related engine components that are not part of fuel injection system. 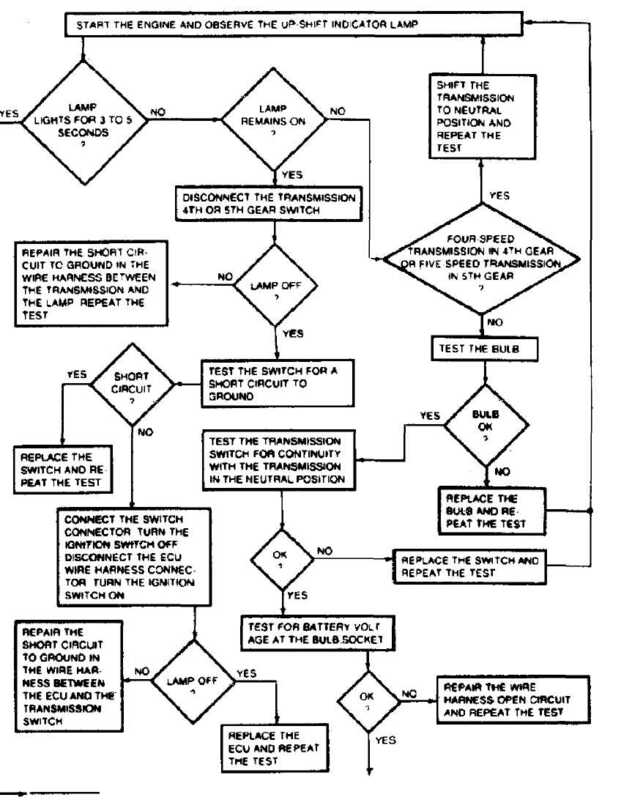 This test checks upshift indicator light function on vehicles with manual transmissions. Fig. 5: Jeep/Renix Fuel Injection ECU Connector Courtesy of Chrysler Motors. Allow engine to cool down. Disconnect CTS wiring harness. Remove CTS from intake manifold and rapidly plug hole to prevent coolant loss. Install replacement CTS and connect CTS wiring harness. Remove air cleaner assemby. Remove injector wiring connector. Remove injector retainer screws and clip. Using small pliers, carefully grasp center collar of injector between electrical terminals and carefully remove injector with lifting/twisting motion. Discard both "O" rings. See Fig. 6. Using light oil, lubricate new upper and lower "O" rings. "O" ring. Position replacement injector in fuel body. pushing/twisting motion to seat injector. Align wire connectors in proper orientation. Install retainer clip and screws. Connect injector wiring. Install air cleaner. Fig. 6: Fuel Injector & Throttle Body Assembly Courtesy of Chrysler Motors. With throttle body assembly removed, remove 3 screws holding fuel pressure regulator in throttle body. Remove fuel pressure regulator assembly. Note location of components for installation. Discard gaskets. To install, reverse removal procedure. Adjust regulator after installation. See ADJUSTMENTS in this article. remove ISA motor from bracket. To install ISA motor assembly, reverse removal procedure. Adjust ISA motor after installation. See ADJUSTMENTS in this article. injector, WOT switch, and ISA motor. 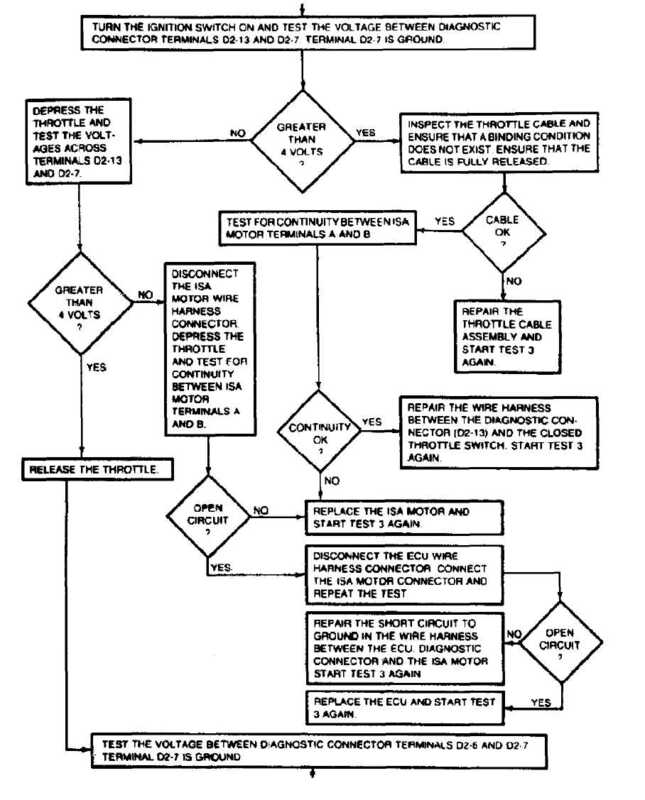 Disconnect fuel supply and return lines at throttle body. See Fig. 7. Tag and disconnect vacuum hoses. Disconnect TPS wiring. Fig. 7: Intake Manifold & Throttle Body Assembly Courtesy of Chrysler Motors. Install replacement throttle body assembly on manifold using new gasket. Reconnect all hoses, wires and cable in reverse order of disassembly. Adjust ISA motor after installation. See ADJUSTMENTS in this article. Remove throttle body assembly as previously described. Remove Torx head retaining screws. Remove throttle position sensor from throttle shaft lever. To install, reverse removal procedure. Adjust TPS after installation. See ADJUSTMENTS in this article. Disconnect wire harness connector from MAT sensor. Remove MAT sensor from intake manifold. To install, reverse removal procedure. See Fig. 7. Disconnect wire harness connector, vacuum hose, and retaining nuts from MAP sensor. Remove sensor from firewall. To install, reverse removal procedure. bracket. To install, reverse removal procedure. wiring harness. To install, reverse removal procedure. Disconnect vacuum hose from EGR valve. Remove bolts which hold EGR valve to intake manifold. Remove valve and discard gasket. To install valve, reverse removal procedure. Always use new gasket. See Fig. 7. 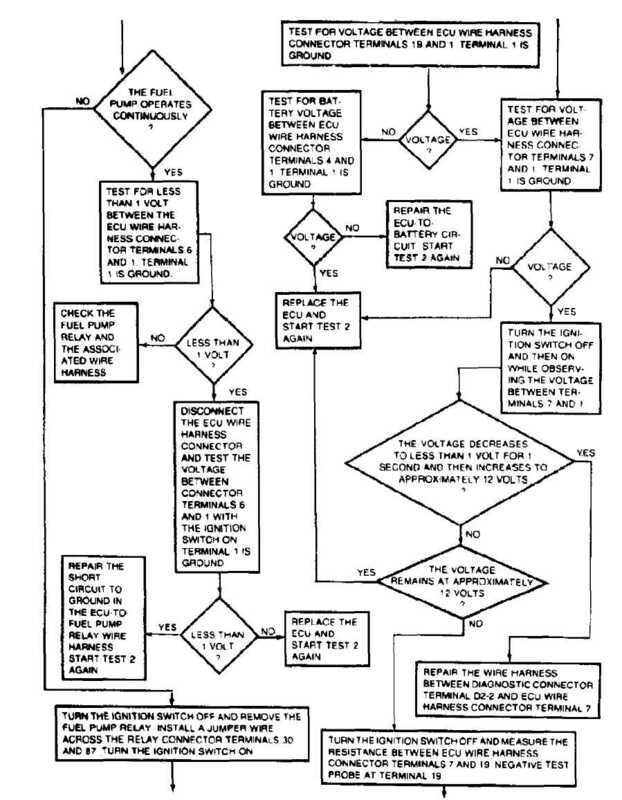 • DO MOT UNFASTEN THE SENSOR WIRE HARNESS CONNECTOR INSERT THE VOLTMETER TEST LEADS THAOUOH THE BACK OFTHE WIRE HARNESS CONNECTOR TQMAKE CONTACT WITH THE SENSOR TERMtNALS. ON SOME MODELS, IT MAY ALSO BE NECESSARY TO REMOVE THE THROTTLE BODY FROM THE INTAKE MANIFOLD. TO QAIN ACCESS TO THE SENSOR WIRE HARNESS CONNECTOR.